Hammock's eye of the the Glass House Mountains, Qld. Travel destinations around Australia. Australian Traveller magazine takes a look at travel destinations in every State around Australia. Every month we critique each destination, including things to do when you get there and choosing accommodation. AT has researched 35 magical short breaks in all states of Australia to give you the best time off this spring. So, no more lethargy and no excuses. It’s time to get on the road. To nail the pre-war Darwin scenes, Baz Luhrmann filmed in tiny Bowen in Queensland. As Australia the Movie gets set to debut in cinemas around the country, AT talks to the woman who single-handedly put the small town on the Big Screen. Australia’s great treeless plain holds a tremendous fascination for travellers in search of a little solitude and a lot of space. Using only public transport and his trusty bicycle, Roger Trowbridge ventured across that plain to see things in a clearer light. Who Killed The Great Aussie Road Trip? Have skyrocketing petrol prices sounded the death knell for one of our greatest national pastimes, the family driving holiday? Justin Wastnage reports. When AT saw the documentary Who Killed the Electric Car, we were equal parts riled up and inspired. So we had Mark Taylor from the Australian Electric Vehicle Association provide us with a state of the union. What’s happening? What should be done? What CAN be done? Before, we knew nothing. Now, like many ordinary vehicles across the country, we are becoming converted. For AT’s driving issue, we bring you this MyPOWER report from Anthony Garagounis, direct from the hybrid Prius support vehicle accompanying the boys on their 16,000km odyssey. Across seven heavenly categories of luxury travel – on the road, in the air, in the snow, on the water, on the beach, in the city and in the outback – Australian Traveller welcomes you inside our most lavish hotels, beach houses, secluded islands, private jets, ski resorts, boats and cars for this extraordinary look at what’s available to those with the means to travel in style . . . Finally. The Ultimate Guide to the Outback made easy. Where is it, what does it mean to Australians, when to go and how to get there. From east to west, north to south, AT has the whole of outback Australia covered with these Top Ten itineraries for the intrepid explorer in all of us. Happy trails . . .
A wayward, wandering kind of bloke, Andrew Bain has walked several thousand kilometers across great chunks of Australia. Let’s pull on the boots and follow in his footsteps . . . Tighten up your laces as Andrew Bain continues to lead us through Australia’s four epic trails. Just try and keep up. Click go the shears — and click go the cameras — in this stunning collection by Andrew Chapman focused on the shearing men and women of outback Australia. Do you realise there are only 13 weekends in the whole of summer? From a vast swathe of AT reader entries, we’ve selected the 13 different weekends we’d most like to do in the months ahead. We know you’re going, you know you’re going: it’s our job to tell you what you didn’t know: what’s new and underrated in your Holdiay Mecca of choice. Stop guessing at what your kids want to do for your next big break. We’ve asked them for you, and from ages 2 to 16 they’ve responded in force, in their own words. Anangu Elders from Uluru have give AT exclusive access to publish some of the most secretive rock art in the world (restricted access, subscribe here). Become an instant expert on our nation’s foremost metro and regional art galleries and the important and fascinating works you have to see (restricted access, subscribe here). The greatest drives in Australia uncovered. We profile our 10 favourites. The drives that we often make, such as Sydney to Melbourne. Our tips on making those oft driven journeys that little bit more interesting. We have matched 18 courses for every kind of Dad and the here is our pick. This close to Christmas, most of the marquee destinations are booked solid. But adjust your search just a fraction and you’ll find plenty of gems still available. We live on the world’s largest island – but does that stop us from constructing fantasy getaways to the smaller ones dotted all along our coastline? Accept that there’s a touch of the Gilligan in all of us, and consider these temperate isles for your summer holidays. Getaways for couples, parents, singles, adrenalin junkies and the near terminally lazy – we’ve got it all, so that you can have it all. Australian Traveller invites you to choose your own adventure . . .
than ten million beats per minute. Holiday ideas for the footloose and fancy free who are out to find the footloose and fancy freer . . .
big in the holidays of a lifetime. Designing a holiday with the little ones is no picnic. We provide a selection that can’t miss. you, we list ten Christmas destinations that are off the beaten track. Think you can’t afford a holiday this summer? You can. We bring you a selection of getaway options that cost less than staying at home. For families, a holiday with the kids is just as important as a holiday from the kids. We help you plan and execute the best possible group getaway. Ten top kid’s clubs from around the country to keep the little ’uns amused. When dream worlds turn to nightmares. A parent’s-eye-view of theme parks. There’s an art to eating out with the kids. Learn it or suffer the consequences. Forget “I Spy” . . . we’ve got a selection of road games for the 21st Century. A perfect aid to your holiday research “homework”, you still need to be wary of the accommodation info presented on the internet. We outline a few tips for you. Looking for a close encounter of the marine kind? Sharks, dolphins, seals, whales… AT shows you which spots to avoid, when to dip the toe, and where it’s safe to dive right in. If huge sections of the B&B industry survive and thrive on the ability to exert control over editorial – basically, to write their own reviews – how do you separate the cream from the crummy? It’s all a matter of breaking the code. Towns, like takeaway joints, offer two choices for the traveller: drop in or drive through. Excluding the capitals, here’s our top-ten list of prettiest spots – and ten ugliest blots – to be found around Australia. Here’s a list of Aussie tourist sites for sore eyes (and noses, and ears) guaranteed to add some icky-yicky yuckness to any itinerary. We present you with Sydney’s 10 best coastal and harbour baths and pools. We argue the relative merits of a B&B versus a Guesthouse. And this one’s a beauty. AT presents a comprehensive guide to Jervis Bay, that summer paradise southeast of Sydney. A story of the catastrophic fires in 2003 that turned the bush to ash, and inspired some courageous acts by volunteer fire fighter Greg Roberts. Hotel Review – BannistersThe lure of a horizon pool, dramatic cliffs and A1 service is all anyone can ask for from a trip to the NSW south coast. The NSW Central Coast has struggled for its place in the sun. But that’s all changing and there’s an increasing number of hidden gems . . .
Byron Bay – The Promised Land? Prodigal son Craig Tansley returns to his town of birth to detail how locals feel about their beloved Byron, and reveals how travellers can find their Promised Land. Looking for fufillment on a promise that Byron now struggles to deliver? 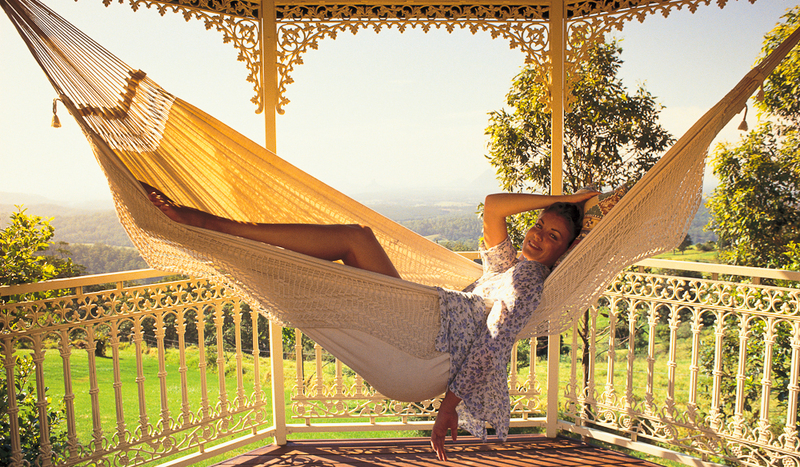 Travel to Byron’s hinterland for the new Promised Land. How many distinct multicultural experiences could you sample in Sydney in the space of a single weekend? Take a closer look at the city one in five Australians call home and you’ll realise the horizon is no longer where you think it is. Woolloomooloo – with so many O’s and L’s, where better to have a hotel with a solitary W for a name? Cheap digs with the Prime Minister just a block away. Saving some bucks while seeing the sights of Sydney is music to the ears of most travellers. So here are ten ways to have a great day without blowing your pay. Uluru is a very special place, but you need to keep a few things in mind if you are taking the trip to Uluru. Australian Traveller lets you in on the secrets to have the “Perfect” Uluru experience. The quality of your guide can determine the quality of your Uluru experience. Australian Traveller road tests Discovery Ecotours Australia. In Arnhem Land, where red dirt roads lead to sacred lands, Indigenous musicians such as the Nabarlek Band are creating songs capable of crossing cultures and intersecting lives. At Jim’s Place in the Northern Territory, the food’s good but the singer’s a bit of a howler. Near the rock, Australia’s most costly campsite is adding some Top End glamour to the red centre. Living the rockstar life isn’t just for rockstars these days. At Palazzo Versace, you can dial up true Italian extravagance any time you like. We explore the natural wonderland that is Moreton Island. Summer is the ideal time for a visit . . . just watch out you don’t get bogged. If you can’t beat ’em, join ’em. Don’t run away from Noosa during tourist season . . . muck in, look around and discover there’s plenty to enjoy just below the surface. The Gold Coast is many things to many people – holiday playground, theme park nirvana, surfing utopia or crass, contrived and overdeveloped urban nightmare, depending on who you talk to. Long-term resident Tim Baker details the numerous and varied attractions of his adopted home. . . If you’d like to see what the Gold Coast might once have been like, the good news is – you still can. An hour’s drive and a 45-minute ferry ride from the Gold Coast delivers you to North Stradbroke Island, a dreamy trip back to the beach holidays of yesteryear. Tired – or wary – of the glitz and glamour of the Gold Coast? Happily, the eco-friendly option of couran cove on South Stradbroke Island is just a wallaby’s hop away. Should anyone doubt that the Gold Coast is and always has been about the risqué, the somewhat saucy, the borderline salacious, this photo from the ’50s is tendered in evidence. The Resorts – Great at any price? The Great Barrier Reef boasts some of Australia’s most expensive, exclusive and enviable holiday resorts. But does high cost always ensure high quality? We savour some of the reef’s richest resorts and pass a critical eye over life in paradise. The Great Barrier Reef is one of the most fragile ecosystems found on the planet. The good news is tourists may be securing its future. Staying on dry land doesn’t make you a drip in Tropical North Queensland. With the rainforests and open roads, there’s loads of treasures – and the odd crass trap – to discover. Proceed with caution when booking your stay in Port Douglas. The old resorts are looking their age, but at least the location is as appealing as ever. South Australia’s sleepy seaside capital is fast becoming one of the world centres for organic travel tours. The French have a saying to do with fingers and noses that may surprise you. Especially as it applies to South Australian wine, sheep dogs, and cycling in the Barossa. You don’t need to be a connoisseur to appreciate Australia’s premier wine region. Tasting is great value but the valley’s beauty goes far deeper than a skinful. A review of the 12 best cellar doors of the Barossa. Not for the faint hearted, this powerful landscape will impress whether you choose the easy way to explore or to wander off the beaten track. The pubs of the southern Flinders are being a rejuvinated – AT samples some of the finest. They bury blokes under beer kegs in Coober Pedy, where there are ample opals underground and plenty of 4WD flunkies from the cities above. When the winter wind whips through Robe on the southern coast, it brings with it the spirits of the past and the fierce splendour of some wild, wild weather. Former Parks and Wildlife officer Steve Robertson delves into those hidden parts of Tasmania most strongly protected by its denizens, and reveals six secret locations that are well off the tourist trail. What to see, where to go, even how to dress for your next unforgettable visit to the apple of the eye of the Apple Isle. Tim Fischer finds time to enjoy one of the Apple Isles most idyllic locations. The Alpine valleys and river-fed fields of Victoria’s northeast are home to Australia’s first gourmet region. And the edible attractions just keep on growing. If you think you know Melbourne like the back of your hand, here’s a different tack that allows for a whole new level of intimacy. Let them eat cake, let them do it each September, and let the entries pour in from far and wide: it’s annual Vanilla Slice Day in northwestern Victoria. An unofficial Gangland Murders of Melbourne Tour struggled briefly for life in 2004, before meeting an untimely – and unpopular – end. For better or worse, we found someone who was willing to retrace the tour’s steps for us . . . The almost completed Great Ocean Walk will take you closer to the bottom of Australia than you can get by car. Which one does it for you – Melbourne’s five star Park Hyatt, or the city’s heartless heart, Crown Casino? Shopping Showdown – Is Melbourne Still Our Shopping Mecca? Sydney’s retail assets are brazenly displayed, but in Melbourne the finest gems are often hiddden. Use this guide to get the best of both cities. AT compares shopping lists and decides who has the goods. Booker Prize winning author Thomas Keneally shares his passion for cross-country skiing the Victorian Alps. In the off seasoin, there’s no better time to enjoy the quirkiness of this lovely region’s undisputed queen, the Grand Pacific Hotel. If your interest in all things cocoa is bordering on OCD, then Melbourne has the tour for you. Melbourne plays itself up as Australia’s sporting capital. We sent a writer on a marathon weekend mission to find out if it’s truly a winner. Movie buffs are heading to Melbourne, where the annual film festival is always a smash hit. The port town on WA’s far southern shore is a haven for crystal clear waters, chance encounters with native wildlife, and empty beaches as far as the eye can see. Perth local Jacqueline Perry-Strickland goes day tripping through the nearby idyll of the Swan Valley, WA’s oldest wine-growing region. Travis Cranley gets an eagle’s eye view of a pod of watery behemoths on their way down WA’s southwest coast. For Perth’s population, Rottnest Island is Nirvana a 30-minute ferry ride away. Its a traveller’s paradise if you know how. Good news, everyone: the extensive Bibbulmun Track can be done the civilised way, with a spa, fresh linen, chilled Margaret River wine and a driver waiting at the end of each day’s walk. Cape Lodge, boutique hotel and vineyard, represents about as rich and full an experience as can be had in WA’s expansive Margaret River wine region. But even the finest wines can be something of an acquired taste. Cruising the wild and remote Buccaneer Archipelego reveals the Kimberleys’ great beauty. Fishing through the eye of a cyclone. Landscape photographer Grenville Turner captures the spectacular colours of the Kimberleys. Mount Bruce sounds like the archetypal Aussie mountain and it’s as good a place as any to breathe in the rare beauty of this vast land. In the hills of Perth, a pizza perfectionist is dishing up the world’s best doughy dinners and desserts. A rugged, remote natural wonder on the outer rim of Australia’s Indian Ocean territory, Christmas Island is perfect for travellers who want to be way off the beaten track.